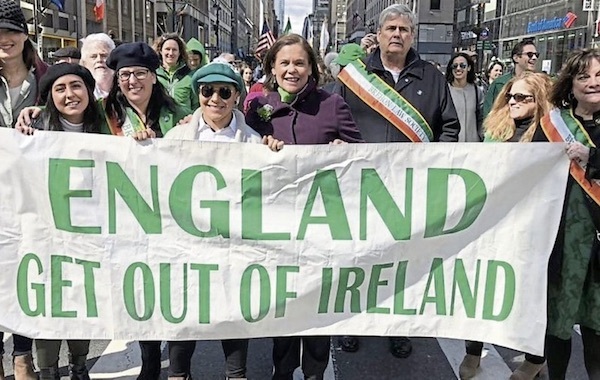 Sinn Fein leader Mary Lou McDonald caused a controversy -- for some -- by posing with a banner reading ‘England get out of Ireland’. The only political banner allowed in the parade, it has been proudly carried there for over 70 years. The simple message of Irish nationalism, Sinn Fein said, requires no explanation. Fine Gael and the Irish establishment media saw a ‘gaffe’ and a political opportunity. They claimed the banner was an expression of sectarian bigotry, and attacked Ms McDonald for being photographed with it. The description efforts bemused Irish Americans, who have presented the same message as far back as the the time of the United Irishmen. Wolfe Tone, a founder of Irish republicanism, said he wanted “to break the connection with England, the never-failing source of all our political evils, and to assert the independence of my country”. The Brehon Law Society, who carried the banner, said it reflected the desire of millions of Irish Americans and the Irish diaspora for the reunification of Ireland. “It is an iconic statement that has been carried in the NYC Parade by many groups for decades. Irish reunification must be planned for and discussed openly and inclusively,” they said. Alliance leader and east Belfast representative Naomi Long took offence on behalf of English people, declaring the nationalist sentiment to be hostile “to anyone English or of English extraction”. Green Party leader Clare Bailey went further, and claimed it called into question Ms McDonald’s commitment to “equality and rights”. There was also no shortage of unionists to take wilful offence, despite not featuring in the banner’s message. DUP MP Gregory Campbell claimed it showed Sinn Fein wanted unionists to leave Ireland, while Ulster Unionist leader Robin Swann said Sinn Fein had ‘returned to type’. Adding to their anxiety were signs of an increase in support for Irish republicanism internationally, with IRA slogans being sung with gusto on a BBC primetime television show ‘This Time with Alan Partridge’, and by the crowds at boxer Michael Conlan’s entrance into the ring at New York’s Madison Square Gardens. Fine Gael has now decided to make Sinn Fein a target at its annual conference this weekend in Wexford, where DUP MP Jeffrey Donaldson will make a ‘surprise’ appearance alongside a cast of other Sinn Fein critics, including Fine Gael’s new signing, former Derry-based SDLP leader Mark Durkan, now rebranded as a Fine Gael candidate in the European elections in Dublin. For its part, Sinn Fein showed no sign of being troubled. A Sinn Fein spokesman said: “The most divisive and offensive act on this island for almost the last 100 years has been the partition of Ireland. “It should come as no surprise that Sinn Fein wants a new united Ireland under the provisions of Good Friday Agreement. Coveney’s attempt to turn a simple appeal for national freedom into a smear to attack republicans brought back echoes of his party’s avid anti-Irishness in years past. It is no coincidence that the controversy arises with elections set to take place in May. The photograph was also no ‘gaffe’ -- Sinn Fein has been actively highlighting its return to its republican roots after a change in political direction saw it lose almost two-thirds of its electoral support in October’s Presidential election. This year, partly as a result of Brexit, it has adopted a more traditional stance, and the New York banner is a sign of that. “You have to remember what is that banner about?” said Sinn Fein’s Michelle O’Neill. “I think some of our opponents have tried to spin this and turn it into that it’s about individuals or people with a British identity, or people who are English. It’s not about that, it’s about the relationship between Britain and Ireland.